You can order an eGift card to get delivered to your email right away, click here. Gift Card Terms and Conditions apply. Usable up to balance only to buy goods or services at Lazy Dog Restaurant and Bar. Not redeemable for cash unless required by law. Not a credit or debit card. Not reloadable. Safeguard the card. It will not be replaced or replenished if lost, stolen or used without authorization. CARDCO CCCV, Inc. is the card issuer and sole obligor to card owner. CARDCO may delegate its obligations to an assignee, without recourse. If delegated, the assignee, and not CARDCO, will be sole obligor to card owner. Card is distributed by Lazy Dog Restaurants, LLC. 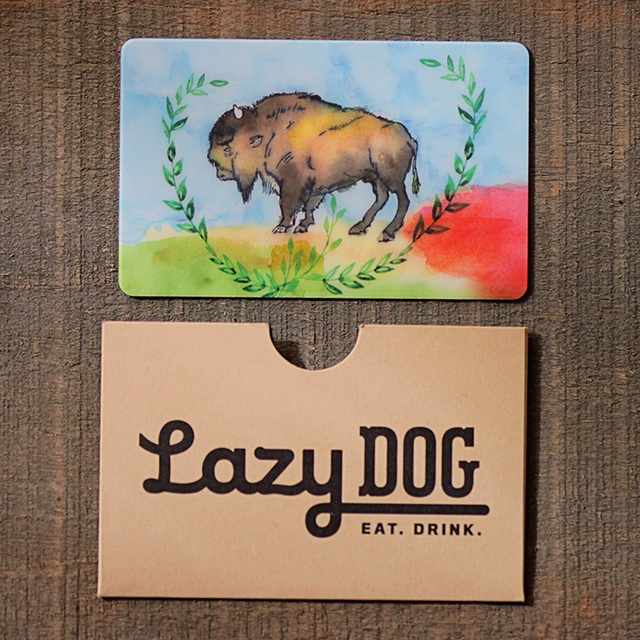 However, Lazy Dog is not an obligor to card owner and is not affiliated with CARDCO. Purchase, use or acceptance of card constitutes acceptance of these terms. For balance inquiries, visit https://lazydog.myguestaccount.com/guest/nologin/account-balance or any Lazy Dog Restaurant Location.